My chilled pea soup quest started after I devoured the most delicious bowl of chilled pea soup at Heirloom St. Paul. The flavors….the fresh pea essence and overall lightness of the soup left me so satisfied. It was one of those moments when you don’t want to eat anything else because the taste in your mouth and head is just so perfect. 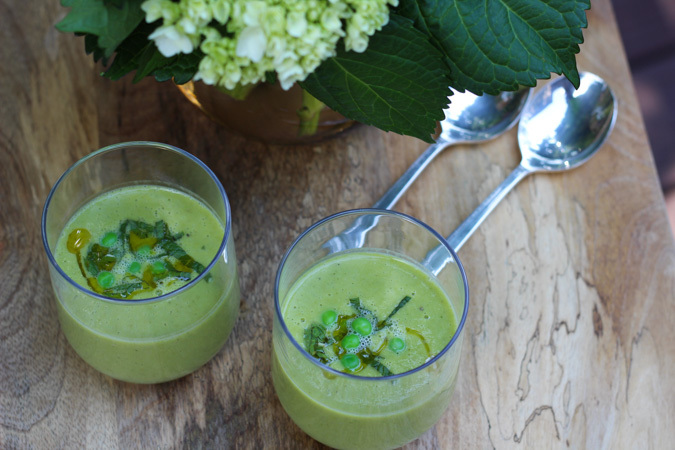 Chilled soups are one of my favorite ways to enjoy the ever evolving summer produce and to stay cool. 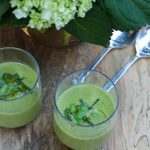 (another favorite chilled soup from a previous post is Gazpacho Soup). Soup fills you up without a feeling of being stuffed. It is food for the soul as they say and making soup is easy (yes it is!) and lets you chill in the kitchen (think Zen), and most importantly, control the ingredients especially the amount of salt (one of my pet peeves is over salted soup). So with great enthusiasm I started making my chilled pea soup. My local farmers market had fresh peas, sorrel, leeks, parsley, thyme, and mint. I was “in the zone” until I realized the vegetable broth I bought was made with mushrooms and tomatoes – OOPS! – not the flavor profile I was aiming for in my chilled pea soup! Truth be told I do on occasion purchase low sodium chicken broth as a short cut when making soup, but don’t often purchase vegetable broth. Lesson learned, store bought vegetable broth ingredients vary. So, I made my own vegetable broth the second time around and achieved the light delicate chilled pea soup from my memorable visit to Heirloom St. Paul. I adapted my chilled pea soup recipe from River Cottage Veg and used Laudemio Extra Virgin Olive Oil as my finishing olive oil. Laudemio extra virgin olive oil is a little pricy, however, a little drizzle in soup, on roasted vegetables, or in a salad will take the flavor to another level – well worth the price! Add the the vegetable broth, peas (reserve a small handful for garnish), parsley and sorrel or lemon. Season with salt and pepper and simmer for about 5-7 minutes or until peas are tender. Cool slightly and purée the soup in a blender or with an immersion blender. Adjust seasoning if needed. Chill for about 4 hours and then garnish with reserved peas, mint and a drizzle of extra virgin olive oil. In a large sauce pan heat oil over medium heat and add all the vegetables, herbs and peppercorns. Sauté for about 5 minutes, stirring occasionally. Add the wine and then boiling water. Bring back to a boil and then turn heat down and simmer uncovered for about 20-30 minutes. Strain the stock and use right away or let it cool down and then refrigerate or freeze. I can never say no to a chilled soup on a hot, summer’s day! Looks delicious and I adore the color. Turned out great!